Well the first week has gone. One one hour lecture, two three hour labs and some extra curricular sweat to get things in hand. One learning objective is to expose students to 3D space using a computer. 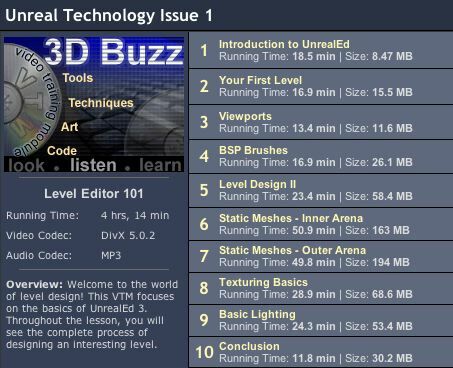 Two teaching tools which we are using and which I find quite amazing are UnrealEd, the game editor for Unreal 2004 Tournament, and screencasting. Much has been written about UnrealEd. Briefly, it lets you create a three dimensional space (i.e. rooms with objects in them) and then by clicking a button, you start the UT2004 game where you can explore and interact with this space you have just created. So, what are Video Training Modules? A VTM is a series of video training lessons that focus on specific topics. VTMs usually have 8 to 12 lessons and range anywhere from two to eight hours in total running time. They are not like your “standard” training videos; they are both entertaining and educational. Our VTMs offer some of the highest quality training available anywhere in the world, and most amazingly – they are FREE! Basically the VTM or screencast of the UnrealEd that I have been using is a close up video of a computer screen showing the Unreal Editor being put through its paces with an ongoing, informative, commentry by a couple of dudes who really know their stuff. The following is a snapshot of the lessons for Module One for UnrealEd. The beauty of the whole thing is that you can be running through the tutorial at the same time as working in UnrealEd. If you don’t understand a point in the commentary, simply rewind to play it again. Or you can pause the action, try it yourself, and then when you are ready, resume with the lecture. Bored with a particular topic? Fast forward over it. One little gotcha with this approach? If you have thirty six students in a lab all trying to listen to their VTM’s at the same time, make sure that they all have headphones!! Orientation. The last time I participated in a first year orientation was way back in 1977. This year, I am doing a couple of design papers at the design school at Victoria University. So I took a couple of hours today to attend orientation. Some first impressions. Obviously everyone is young. As a work colleague said, it is possible that some of the students could be children of the students I taught back in 1982!! A sheet passed around requiring students to fill in their names and birth dates confirmed this. All were born around 1986 with one born in 1981.